The long-awaited follow up to the GT-10 has arrived. Meet the new BOSS effects flagship, the GT-100, boasting next-generation amp modelling that recreates vintage amps as well as providing new COSM tones that soar into the future. The user interface has been improved with a unique dual-LCD system, and EZ TONE has been enhanced with newly designed AMP CUSTOMISE and OD/DS CUSTOMISE features. 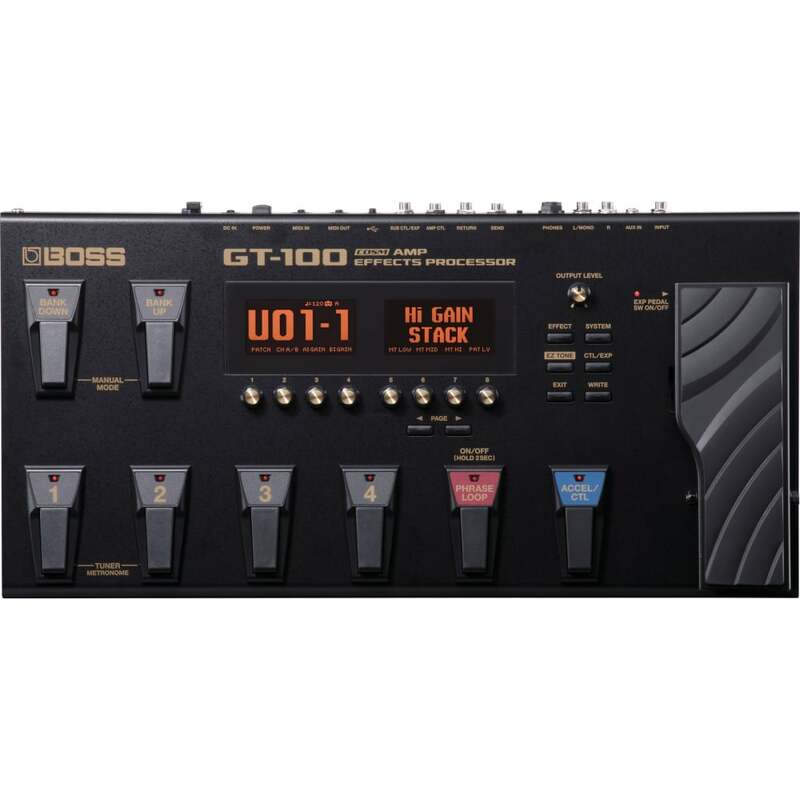 The GT-100 is a powerhouse processor that spans from classic to futuristic in a friendly, rugged,road-worthy unit. With its next-generation COSM processor,the GT-100 ushers in a new era of expression and sonic capabilities. Recreating the meticulous details of vintage amps and how they behave, the GT-100 excels in not only cloning classic amps but provides a new world of unimagined tones as well. The AMP CUSTOMISE function lets you mutateclassic amps beyond. The GT-100’s unique dual-LCD and eight-knob user interface provide fast access and intuitive control. There are no menus to navigate; every function is instantly available. The tone-customizing functionality has been improved as well. All patches, amps, and overdrive/distortions can be created from scratch and/or customised with the friendly graphical TONE GRID. A new dimension of expression is available with the ACCEL pedal, which enables control ofmultiple parameters simultaneously, as well as time-variant effects such as FEEDBACKER, S-BEND, TWIST, etc. Experiment with creative combinations of parameters, interacting in real time with the pedal. Another notable new feature onboard the GT-100 is the versatile A/B Channel Divide. Assign different amps and effects to each channel, and divide the signal not only by dynamics but by frequency as well, with each channel capable of driving its own effects and amps settings. The range of tonal possibilities gets wider, and wilder! Assign smooth, mild lead tones to the mid-to-high pitches, for example, and heavy, cutting tones to the lower notes. Weight 4.8 kg10 lbs. 10 oz. Very practical! I just love it.